A dozen or so cheap comparisons could be made, from Apollo 13 on Mars to Robinson Crusoe on Mars. Ridley Scott is best known for creating the iconic science fiction films Alien and Blade Runner, as well as well as the Alien prequel, Prometheus. In The Martian, Scott deviates from his pessimistic themes and fantastical elements to create a realistic mission to Mars. After the misfire of Exodus: Gods and Kings, and the divisive art film The Counselor, The Martian marks a welcome hit in Scott’s canon. Like the first cavemen, Mars travelers face a harsh, unforgiving world . The film didn't need fantastic elements like homicidal robots to up the ante... survival is the most simple and effective plot motivation of all. Humor and suspense, and just a little pathos, The Martian hits all the right notes. It's actually quite amazing for a space film to hit four quadrants. Being a literary adaptation from Andy Weir's book, The Martian attracts book club Moms; model plane building dad are a given; and intellectually curious teens will find much to engage with as well. Boys are stereotyped as more mechanically minded, but there are enough female astronauts and technicians in the film to inspire girls as well. For those who don't care about space one way or the other, humor and intense set pieces keep the film moving and engaging. Despite some salty language and a shower sequence of Matt Damon, The Martian is fairly safe entertainment. Were I betting man, I would wager that this film will inspire a generation of scientists and engineers. While many space films have a existential terror about science, in The Marian science and ingenuity save the day. The Martian is a fantastic film, and it will likely make my top 10 of 2015. 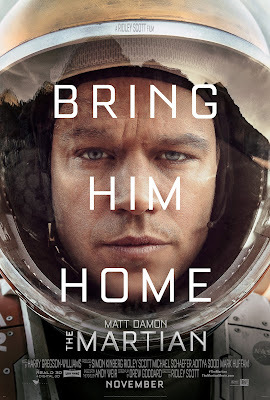 Jessica Chastain, Kate Mara, Kristen Wiig, Jeff Daniels, Michael Peña, Sean Bean, Chiwetel Ejiofor Benedict Wong and Donald Glover all star as NASA scientists, astronauts and administrators working to rescue Matt Damon's character.